Operating with the brand’s motto of ‘Be At Home,’ the Homewood Suites by Hilton™ Hotel Halifax is a long-stay property designed to be a home away from home. The design concept reflects this, with a generous splash of warm colour palates immediately welcoming guests as they enter through the lobby. Additionally, the concept is reflective of the Maritime region and effortlessly displays the relationship between nature and man-made elements including local architecture and the historic Citadel. The feeling of home is evoked by subtle touches throughout the property, from comfortable seating in the lobby to a home-style ceiling fan in the guest rooms. Wood cabinetry and stonework in the buffet area emphasize warmth and comfort, allowing guests to feel right at home. Historically, references to the Citadel are inescapable, and references to the rich history are subtly peppered within the public spaces and guest rooms of the property. 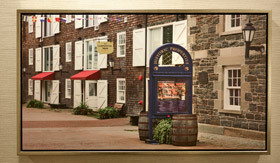 The use of photography sourced from two local photographers – Bruce Thomas and Hugh Andrew, who the hotel designers serendipitously found on Flickr, beautifully display architectural elements from Nova Scotia’s past and present. Photography also includes images of 19th century military, a nod to the province’s history. Born in Yarmouth, NS, Bruce Thomas is a photographer with a life-long passion for capturing the natural beauty Nova Scotia has in abundance. His interest in photography started at an early age, piqued by a photograph printing kit he received as a Christmas gift when he was 15 years old. This interest served as a hobby for many years and was supplemented by environmental and conceptual art made from items found in nature such as sticks, rocks and sand. During a period of respite from Lymphoma, Thomas continued learning about different photography techniques including high dynamic range imaging. This is a technique Thomas uses today in many of the images seen at the property. Hugh Andrew is a Canadian photographer with a zest for life and a passion for adventure. With many titles to his name, including a former actor, former military officer former government official and a recipient of The Order of St. John for saving two lives, Hugo considers himself an optimist. He strives to capture images of the world we live in and encourage others to chase their dreams. The lobby is warm and inviting with the use of rich reds, warm yellows and burnt orange and bold designs. The colour palate is softened with the use of natural tones such as cream, cappuccino and dark chocolate used in furnishings and light fittings. 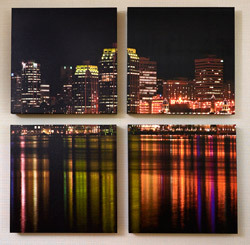 Artwork is placed to create a sense of arrival, with a strong sense of history and architecture unique to the east coast. A basket-weave floor design is a detail that sets the stage for the rest of the hotel, its simplicity juxtaposed by rich colours, textures and materials. Large and comfortable banquette U-shaped seating is set adjacent to an open fireplace with a large sailboat on the mantelpiece, creating a communal meeting place and helping guests to find a home away from home in the Maritimes. The fireplace is clad in rich, textural stone and adds to the comfortable, homey feeling. A natural progression from the lobby, the space opens up directly to the Homewood Lodge with its seating, dining and lounge area. Public areas, like the lobby, are vibrant and sleek. The carpet patterns lead the eye to organic shapes that mimic the natural environment surrounding the property and, reflecting this, the walls are textured. The public area also contains a business centre, an inviting extension to the lobby. It offers an abstract sense of place and history, a modern area where guests can allow themselves to be intrigued by the artwork. A rooftop terrace, needing little in the way of décor, offers stunning sight lines to the bay. With several seating configurations from lounge seating to dining tables and chairs, there is a space to suit any mood. Built in landscaping and a wood lattice arbor create a garden-like atmosphere and a gas BBQ allows for guests to host their own outdoor gatherings. The Lodge welcomes guests with a colour palate of golds and taupes with rich chocolate and espresso wood accents on a base of neutrals. Pops of colour are evident in the carpet inlay, with organic-shaped pieces layered with colours and textures reflective of the fall seasons. 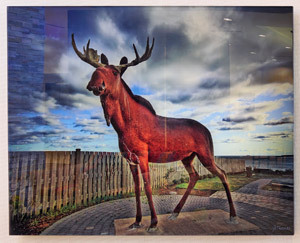 Artwork in this area focuses on local Maritime culture and its proud history, demonstrated by large, colourful, original photographic art pieces sure to inspire guests and invite them into the space. Additionally, the photography serves to bring the outside in, showcasing unique history, culture and architecture. This is supplemented by a peppering of artefacts and the deliberate use of design materials and textures. Finishes are neutral, organic and natural and a large, traditional chandelier completes the look. 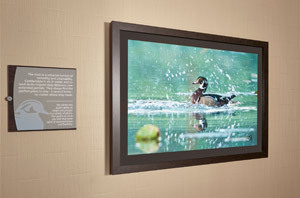 After enjoying a short walk down a corridor packed with local photography, guests are greeted by a large glass feature wall as they enter the fitness area. The custom piece is inspired by a sail blowing in the wind, and is an introduction to the regatta theme throughout. As guests exercise on “self-powered” equipment and bask in the cool refreshing space overlooking the pool, they are inspired by the thrill of the wind blowing through the sails and the freedom of racing on the open water. This ambience of excitement is juxtaposed by the natural, earthy tones of the fitness area, bringing a sense of balance and allowing the theme to speak for itself. A large mural wall, unique and native to the local culture of Halifax, and the abundance of natural light and high ceilings completes the space. Guest rooms are truly a home-away-from-home, complete with amenities including a full kitchen, cooktop, dishwasher, sink, dining area, full vanity area and a spacious closet. Suites offer seating areas comprising a loveseat and small ottoman and the area is designed to feel much like a condo. A traditional ceiling fan adds to this. The décor is subdued and earthy, with brown, taupe and green tones, with splashes of local photography to bring the outside in. The modern and chic SilverBirch Conference Centre® contains bold finishes with the use of rich blues and pops of red, combined with the more subtle browns, burgundies, creams and charcoal colours. Polished chromes, dark chocolate carpets, rich leathers and woods enrich the ambience of the space. Expansive windows let in natural light, complimenting the goal of connectivity and productivity. A variety of meeting room sizes offer options for a range of groups and include a break-out area and private rooms to meet the immediate needs of business guests. The space is truly multifunctional, with mobile furniture and malleable room set-ups suiting any event, incorporating the newest ideas and most up-to-date features and technologies. Modern and contemporary artwork and flooring design are used to amplify the clean and linear feel of the state-of-the-art design of the conference rooms. Signage is sharp and crisp, directing guests and providing an element of freshness and innovation. The SilverBirch Conference Centre® serves as a natural connector to the adjoining Homewood Suites by Hilton™ Hotel Halifax. The nearby Connection Café® offers conference guests fresh foods such as mini indulgences and healthy options and refreshing beverages including smoothie shots and fresh juices.